Let's start with Yomi. The image you see above is the complete first edition, costing about $100. That's quite expensive, but you only really need to buy a set of 2 characters for $20. That does make for a reasonably priced game. It's basically trying to make a fighting video game in the form of a card game, and it does a reasonable job of that. 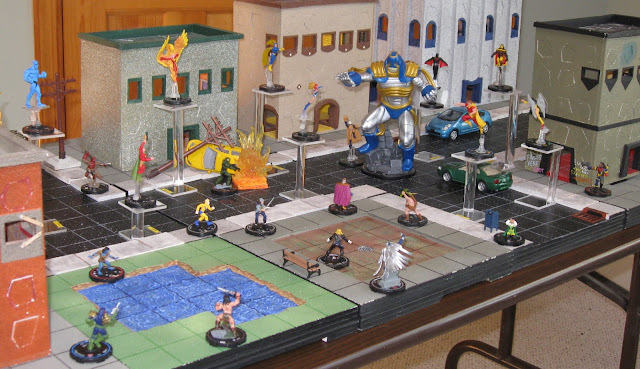 The only aspects I see missing from it are zoning (which takes a dominant role in its older sister Flash Duel) and execution demands. The lack of execution is by design, allowing people to get the feel of a fighter game's strategy without having to train so much on how to physically do moves with your fingers. 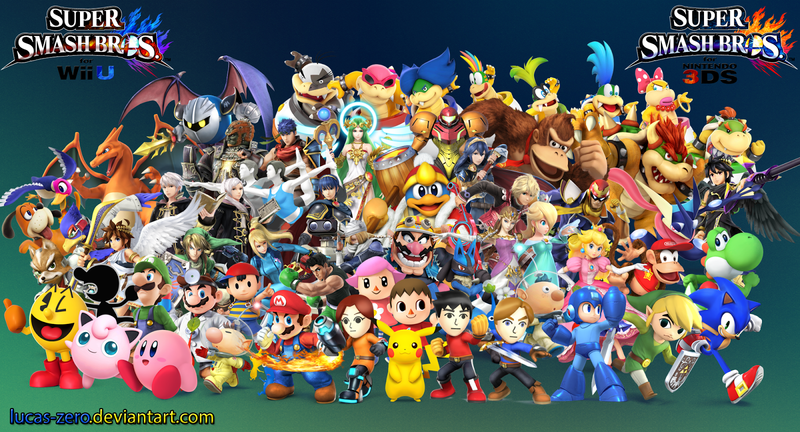 Its cast of 10 characters is pretty diverse, incorporating common staples of the genre's playstyles while also introducing original concepts essentially unexplored in existing fighter games. It all comes down to a very simple rock-paper-scissors style of gameplay. From a starting hand of 7 cards, both players play a card face-down. 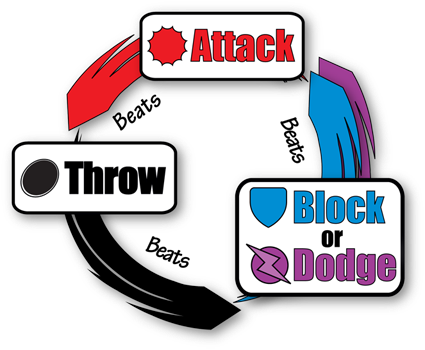 The winner of that exchange is dictated by the above diagram, and different things can happen for whoever won it. 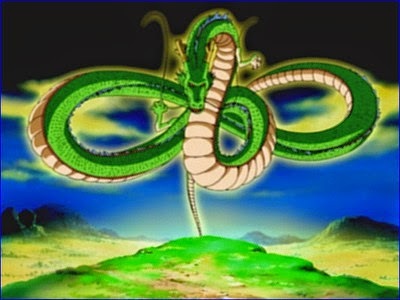 Each of the 10 different characters has different specialties that and motivations for preferring certain options. For example, the ninja obviously likes to attack a lot, so you'd immediately think block/dodge would be a good option. However, she knows that, so if she expects you'll do those, she can put out a throw to beat it. If you know she's thinking that, you can try to attack instead... and you see the conflict you get here. Ultimately, victory really comes to who can get into the opponent's head better. It's not overly complicated, and worst-case scenario that you don't like it, you've got some very nicely drawn poker cards. The other game Puzzle Strike is pretty much what you see here. 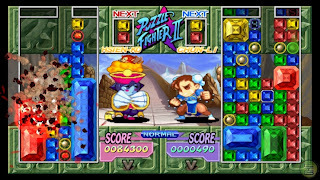 Ok, it's not, but Puzzle Fighter is basically the game it's trying to replicate. 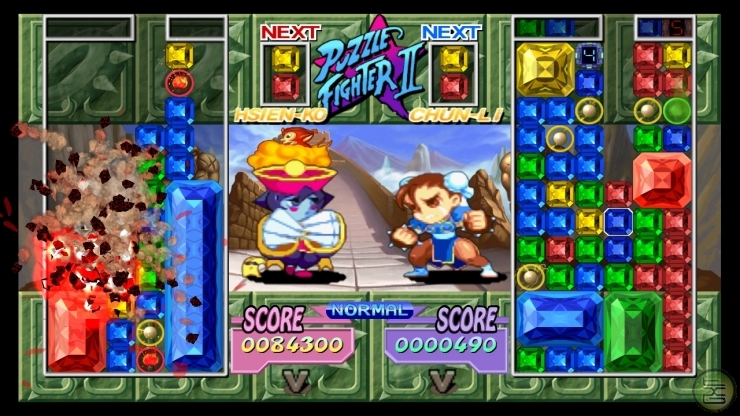 If you've played other gem-based puzzle games like Dr. Mario, you've got the basic idea. Fill up your opponent's screen with enough gems that it can't hold anymore. Puzzle Strike uses this as the objective, but also incorporates deckbuilding aspects such as what we've seen with Dominion & Ascension. Instead of having to shuffle your tiny deck of cards a lot, you just get a bunch of poker-style chips and a bag to shake them up. That's really all I have to say about it. Take these two elements, combine them, and see what you get. The game is remarkably quick, taking about a third of the time I normally would get out of Dominion. I'm not sure if that's because of the game's overall design, or we just don't quite get it yet. 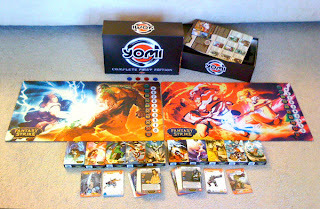 Oh yeah, and those 10 characters from Yomi? They're here too. Each player gets 3 character-specific chips, so you're never going to see decks turn out to be too similar (that always kind of annoyed me). Both of these games are reasonably quick, unlike other games I'm normally into. I'm gonna be trying to introduce as many people as I can to these games, not the least of which because I want my friends to actually compete in a fighter game with me and be on even footing. At least, even until I figure them out.